Dear visitor, welcome to the ever work-in-progress wiki on the 3d printing of musical instruments. The goal of this website is to provide a platform for people interested in creating new kinds of musical instruments with 3d printing technology, while supplying them with the necessary information to get started and to get further. Because knowledge in a cutting edge field like this is spread and there is no one with a specialism yet, the form is an open wiki. Please note that this means this is an ever evolving document, so if you have anything to contribute, correct, comment etc. please feel free to do so, or contact the editor at arvidj at gmail dot com. A concept design from MIT Media Lab, to illustrate the possibilities with 3d printing. Not yet manufactured. This wiki has come forth out of a joint BSc Industrial Design and BMus MediaMusic research project of the editor. 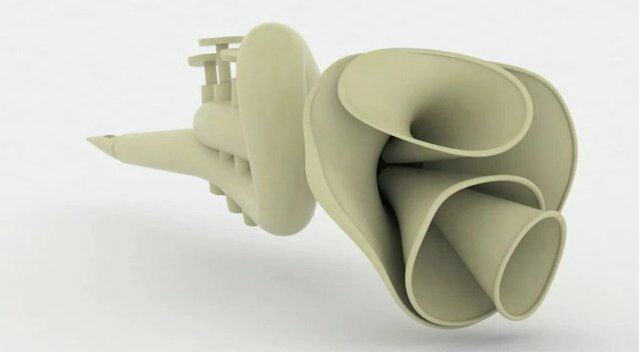 On seeing 3d printing technology and Fablabs popping up like mushrooms, one gets excited for the new possibility's this creates for musical instruments. This might be a new field of research in the musical instruments industry, and I'm willing to set a first, open step! Through this research the editor hopes to get the required knowledge to start 3d printing his own instruments, as well as opening doors for future research positions. While there are some issues with intellectual property of the 3d printing of files spread through the internet, in this stage of innovation it is assumed that everyone benefits most from the free availability of all this knowledge. And while talking about Ethics, there is a big point to be made for 3d printing, as it (in time) will be more sustainable than current manufacturing methods in specialized products such as musical instruments1. What are the new possibility's rapid manufacturing (RM) creates for working principles of musical instruments? What are the principles of operation for traditional musical instruments? What RM methods are available? How do these methods provide (dis)advantages for musical instruments? What kinds of instruments are already made by RM? To find the answers to these questions, there has been made use of internet resources as well as physical literature, all sewn together by a Industrial Design and Music student. For correctness, there has been help of a Chemical Engineering teacher specialized in 3d printing. For the start-up of this website, research has been limited to proven technologies. Also, due to limited knowledge and experience of the creator of this site, some information might be wrong, if you encounter such a thing, don't fret to correct it! In this research we're exploring the possibilities of for the manufacturing of musical instruments with present available technology as well as conception the possibilities for the future. We're not limiting ourselves to replicating currently-in-use instruments, but we'll try to make full use of expanded possibilities. Because of the explorative nature of this research, it would be a shame to limit it to my own creativity. For this reason I want set it up in an open-source fashion, I’ll make an open wiki and I’m going to actively search for input on various websites and forums. Use this page for general discussion and comments relevant for the community. The first stage in the creation of this platform, is gathering the necessary information to get people started and to present is in a way that is easily digestible. Second stage would be to gather a small community to improve on information and start the sharing of ideas. The third stage would be to rebuild the site to a community/sharing place, as the hub of musical 3d printing in the world. Please note that while the research has been about Rapid Manufacturing, the 3d printing angle seemed to be the most promising angle, and for findablity, the name of the site has become "3d printing" instead of "rapid manufacturing".